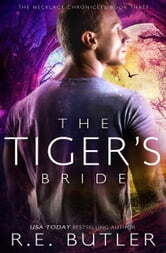 As the last golden-furred tiger shifter in existence, Charisma Gains knows that his best chance to find his soulmate is on the All Hallows’ Eve full moon. With an enchanted medallion in hand, Charisma casts the spell for his soulmate, hoping against hope that the necklace will find the one woman meant to be his. Unless he finds his other half, he’ll go feral, his beast slowly taking over. When Valerie Winter sees a beautiful necklace with the image of a tiger on it at a flea market, she’s overcome with the desire to own it. With the cryptic words of the merchant ringing in her ears, she takes the necklace home and puts it on before the moon rises on All Hallows’ Eve. She passes out and wakes up in the woods, face-to-face with a big cat. Valerie is asked to believe the impossible: that shifters exist, that the man before her can change into a tiger at will, and that she was destined to own the necklace because they’re soulmates. Charisma knows it won’t be easy to convince Valerie of the truth in the span of a day, but if she refuses his advances, the necklace will return her to her home and he’ll lose her forever. What he doesn’t expect is interference from the very wiccan who helped him, and for Valerie’s life to be on the line. Loved the storyline in this book from the author. Very steady pace and the characters are fantastic. I am voluntarily leaving my honest review of this book. This is book 3 of The Necklace Chronicles by the author. Wanted to read more, but the end came too soon Is there a follow up on this story. Wondering how they would have manage kids?